Excelite, a leading manufacturer of pool enclosures, announces its model J wall mounted swimming pool enclosure, designed for pools that are close to walls or houses. Excelite, a leading manufacturer of pool enclosures, announces its model J wall mounted swimming pool enclosure, designed for pools that are close to walls or houses. Model J features a 2 to 3 mm anodized aluminum frame and a 2mm solid polycarbonate sheet with a thin UV protection layer. 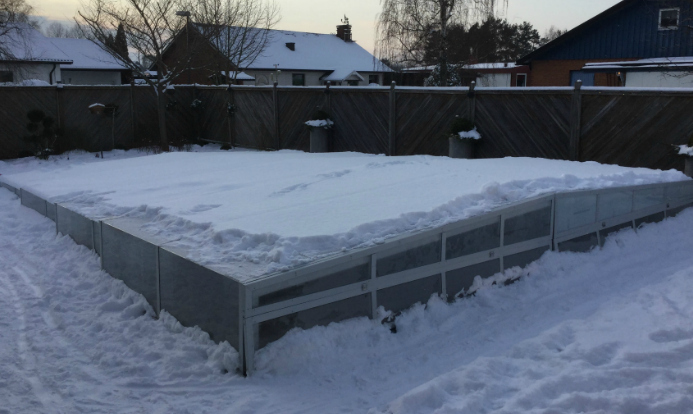 Homeowners in snow prone or high wind speed regions can now use Excelite Model J enclosure to protect swimming pools from devastating weather conditions. 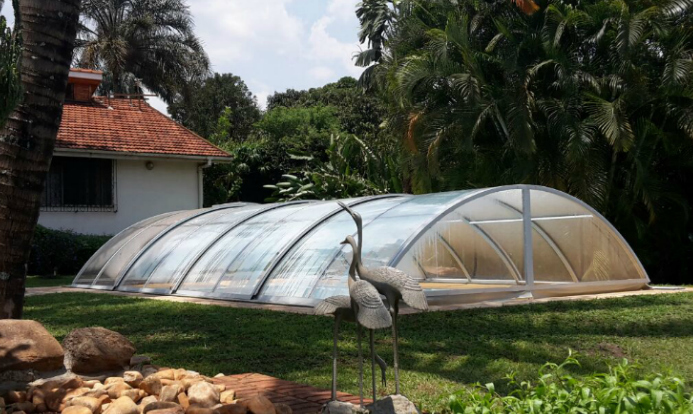 This swimming pool enclosure is a wind rated accessory that can resist speeds up to 250km /hr. and it has passed the snow load test. 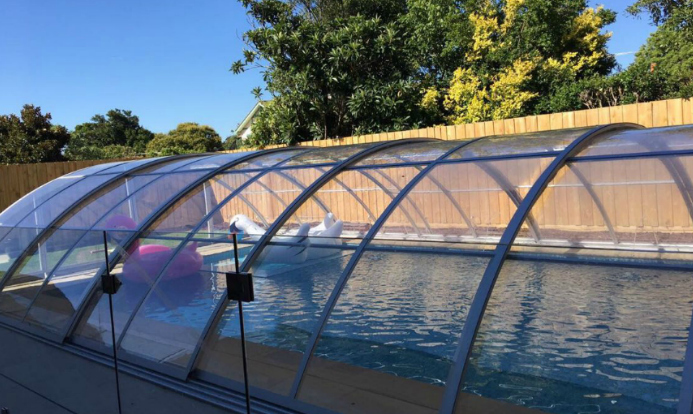 The new Model J is a retractable swimming pool enclosure, available in different standard and custom designs depending on the size of the pool. There are two door options – either at the furthest end or side. In addition to these, Excelite wall mounted enclosure comes with customizable aluminum frame colors such as silver, white, black, grey, etc. The polycarbonate covers come in different tints that allow different light transmittance rates. Every retractable section of the Model J pool enclosure has wheels, for sliding the covers back and forth. It has a self-latching and a lockable door. The adjacent retractable segments have EPDM material that seals the spaces between its layers. This completely isolates the swimming pool from the external environment. Excelite Model J pool enclosure may have different roofing designs such as flat, dome and sloped, among other customized options. 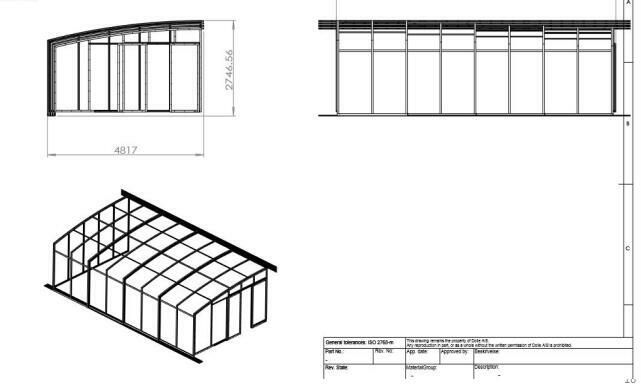 This is the 7th swimming pool enclosure model Excelite has introduced in the market. The price of this wall mounted swimming pool enclosure starts from $2,999, depending on the designs and size. Each model comes with an installation and maintenance instructions. For over 15 years, Excelite Plastic Ltd. has designed and manufactured hundreds of snow rated swimming pool enclosures that conform to the American and European quality standards. At the moment, Excelite has over 7 different swimming pool enclosure models with prices starting from $2,999. Excelite adheres to strict manufacturing criteria as required by the ISO 9001:2008.